As a team, Stan Laurel and Oliver Hardy achieved greatness in the world of classic film comedy, second only to Charlie Chaplin. But, many are unaware that Stan and Ollie appeared solo in hundreds of films before their teaming. Oliver was in about 270 films without Stan, but only around 100 of them still exist. Little is discussed about the life and comic genius of the team’s bigger half, Oliver Norvell Hardy, a.k.a. Babe. Since I was about 10, I’ve been watching their films. Laurel and Hardy, or “The fiddle and the bow”, were unlike the other comedy teams. While The Marx Brothers and Wheeler and Woosley dealt with characters in a crazy society, Laurel and Hardy films, in my opinion, stood out because the boys struggled to fit into a “normal”, or orderly world. But, they could only fit in with each other. Their work remains priceless. Norvell Hardy was born in the small farm town of Harlem, Georgia on January 18, 1892. His father, Oliver senior, died on November 22nd of that year. So, young Norvell was raised by his mother Emily. The family moved to Milledgeville, Georgia where Emily became manager of the Baldwin hotel. Norvell attended Georgia Military College, and later Young Harris Mountain college as a teenager. By around 1910, he used the name Oliver Norvell Hardy, and became manager and projectionist in charge of the first movie house in Milledgeville, called the Electric Theater. Here was his introduction to the movies. All before his very eyes, this exciting new medium must have inspired the young Oliver to enter the world of show business. Blessed with a great voice, Oliver left the movie house and made his way as a singer in the cities of Jacksonville and Atlanta in late 1912. The next year he married Madelyn Saloshin. By 1914, Oliver started acting and joined the Lubin company in Jacksonville, Florida. 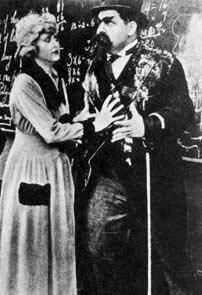 He called himself Babe at this point, and appeared in dozens of short comedies under the production of Arthur Hotaling. 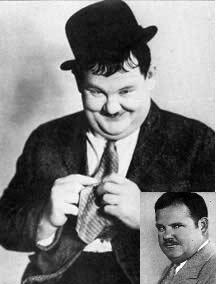 Records show that “Outwitting Dad” was the first film made involving Oliver Hardy. Babe played Reggie, who helped his brother get married. Sadly, this film is lost. “The Servant Girl’s Legacy” from November 1914 from Lubin is the earliest Hardy film in existence. In it, Babe played a gardener who fell in love with a servant girl, played by Mabel Paige. Operations at Lubin in Jacksonville went on hold. Studio members Raymond McKee and Will Louis soon joined the Edison company in New York. Oliver, already knowing McKee and Louis, also went there and made a number of films for the company. Meanwhile, it was Raymond McKee and Will Louis who ran this New York unit. Babe also did limited film projects with other small companies in New York including Novelty/Mutual, the Mittenthal film company, and the Wizard comedies. Wizard was run by Louis Burstein, who was to form Vim. By 1915 Oliver left NY and joined the Vim company in Jacksonville, Florida and appeared in over 60 comedies, sometimes even directing. He was part of the “Plump and Runt” series of comedies with Billy Ruge. Operations at Vim didn’t last long and by 1917 the company was taken over by King Bee.